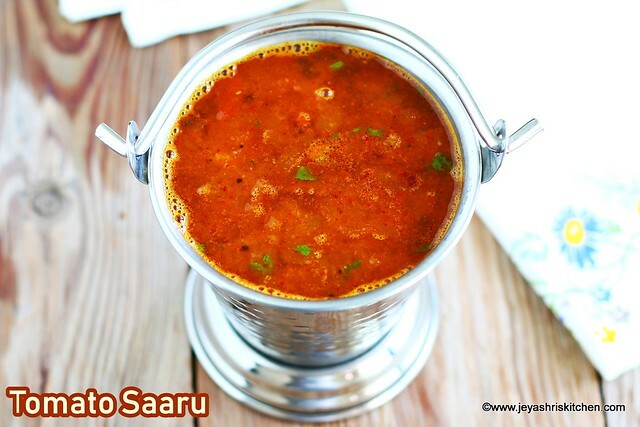 Tomato Saaru recipe | Mangalore Rasam with step wise pictures, an aromatic, delicious udipi style rasam recipe made using freshly ground rasam powder. 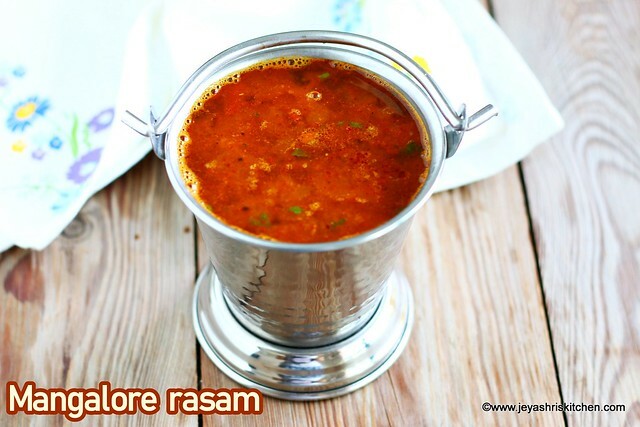 Rasam is a very staple food in most of the South Indian households. 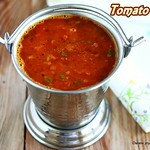 I have posted different varieties of rasam recipesin Jeyashris kitchen. This mangalore rasam, recently i tasted when we had a potluck with friends after deepavali. I instantly fell in love with that Mangapore rasam also called as Tomato Saaru. When i asked her for the recipe, she sent a detailed recipe with perfect measurements. After that i tried this twice at home. It has become our family favorite now. I was so surprised to see that they don't add black pepper in this rasam. Also they boil the rasam after adding the dal water, which we usually don't do for our Tomato rasam recipe. And tempering is made first and then after that the rasam is boiled for 20 minutes. Generally this rasam is served as a soup and also along with rice in Mangalore weddings. As such i love to try out traditional recipes from other States of India, so this recipe is a super hit among them. Do try this rasam and let me know how you liked it. First let's make the Mangalore style rasam powder. In a pan add 2 tsp coconut oil and add in the dhaniya seeds, cumin seeds and venthayam. Roast them in a low flame till it emits a nice aroma. Take it out and keep out. In the same pan add 1 tsp oil and add in the kashmiri red chili, asafoetida and curry leaves. Roast them for few minutes in a low flame. Once it is done, switch off the flame. Grind this into a powder. It will be slightly coarse only. You can blanch and make it as a pulp too. Extract tamarind juice from 1 and 1/2 cup of water. In a vessel add the tamarind juice, tomato puree, slit green chili, turmeric powder and salt. Allow this to boil for 5-7 minutes. Now add 4 tsp of the rasam powder. The powder itself came around 4 -5 tsp approximately. If you want to add all the powder, you can add also. Add the cooked dal along with 1.5 cups of water. In a small pan heat 1 tsp of coconut oil. Temper with mustard seeds, red chili and curry leaves. Bring the flame to low. Let this boil for 20 minutes. Flavourful Mangalore rasam is ready. This rasam can be had as a soup too. In a vessel add the tamarind juice, tomato puree, slit green chili, turmeric powder, jaggery and salt. Add the cooked dal along with 1.5 cups of water. If you use the option of grinding the tomatoes, then use 1 cup of water only. Use kashmiri red chilis for this rasam. Coconut oil brings out the flavour of the tomato saaru | mangalore rasam, so do not skip it. Add coconut powder; enjoy south Indian flavour on tomato saaru.